Oscar and Carlos Tevez: HERE COMES THE MONEY! 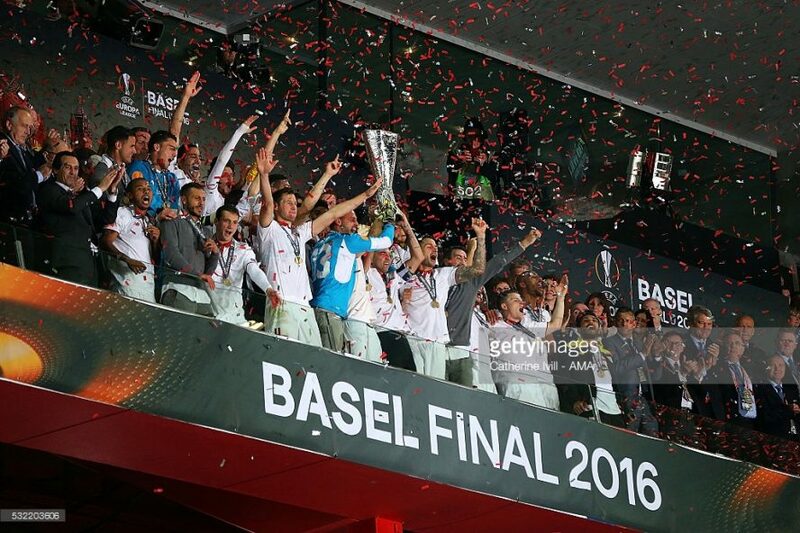 It was a tale of two halves as Sevilla FC defeated Liverpool through three second half goals to give them their third consecutive Europa League title. After Daniel Sturridge scored in the first half, two goals by Coke and one by Kevin Gameiro in the second clinched the victory for Unai Emery’s side. It turned out to be a rainy Wednesday night at Basel, but the intensity was at a high pace and the goals were world class. The first half, Liverpool dominated proceedings. They used Jurgen Klopp’s heavy metal football to surround Sevilla players, force turnovers, and keep them away from goal. The only player who was able to stay calm under the pressure was midfielder, Ever Banega, even when surrounded he was able to retain possession and get out of pressure. Liverpool were unfortunate not to get one penalty call after three hand-ball instances in the box. Carrico seemed to handled when Roberto Firimino tried to go past him, Adil Rami looked to have the ball skim his palm as Alberto Moreno crossed into the area, and Daniel Sturridge made a through-ball pass which grazed Krychowiak’s hand and stopped in its path to Firimino. Even with that, the Merseysiders found the advantage in the 35th minute when Sturridge latched onto an outside the foot shot past the far post of David Soria’s goal. The English international had been quiet until that moment where he received a Phillipe Coutinho pass just outside the box and caught Sevilla off guard with a quick shot to put Liverpool up. Sevilla looked asleep throughout the first half. Most of their possession was further back and when they got into the midfield and front-line, they were hassled into turnovers. The best opportunity came at the feet of Kevin Gameiro who placed his overhead kick just wide of the mark. The French forward could not find space as defender Kolo Toure kept him under wraps throughout the first portion. In the second half, Unai Emery’s men burst out with a lively start. Within the first couple of seconds, the ball came out to Brazilian right back Mariano, who in his first foray into the attack megged Alberto Moreno and squared to Kevin Gameiro for him to easily dispatch past Simon Mignolet to give the striker his 25th goal in all competitions and leveled the match at 1. The La Liga side could have gotten a second two minutes later, when the Frenchman got put through on goal, but before he could release the ball, defender Kolo Toure blocked his shot. After some beautiful interplay, Sevilla took the lead when Vitolo combined with Ever Banega to beat multiple defenders. The 26 year-old midfielder took a touch too long , but Coke was able to smash his shot past Simon Mignolet’s net, which put the Sevilla supporters into a frenzy. All the hard work done by the English side faded away as they could not regain their momentum from the first half. Klopp brought on Divick Origi for an ineffective Firimino. It did not stop Los Rojiblancos from attacking and soon they doubled their lead. Nathaniel Clyne tried to clear the ball but his clearance smacked off of Coutinho and rolled to the unexpected feet of Coke. The converted right midfielder clinically finished past Mignolet and gave the Spanish club a 3-1 advantage. The Madrid-born midfielder could have gotten a hat-trick but his shot was blocked. The whistle blew with Liverpool not being able to muster much of a comeback and the Andalusian side rejoiced after another Europa League final victory. Banega > Coutinho. In the battle of the play-makers, Ever Banega won this battle. Always being around the ball, holding it up strongly among challenges of multiple defenders and always keeping his cool. Banega kept himself around the ball and helped set-up the game-winner. The Brazilian midfielder did have the assist for Liverpool’s goal, but always on the outskirts of the game. He did not have the impact on the game that was expected coming from a player of his quality. The Argentine made more accurate passes (39) than Coutinho made total passes (28), and had twice as many touches as the Liverpool midfielder (73-36). Man of the Match, Coke: It was a bold decision on Unai Emery’s part to put the Spanish right back into a midfield role above Yevhen Konoplyanka. He gave them much needed stability and he ended being at the right place in the right time on both goals. He made a run into the path of Vitolo’s dribble and took over by striking a hard shot past Mignolet and his second goal found him in offside position but Liverpool played the ball to him so he was onside. His brace gave him his first two goals in the Europa League and three in all competitions (1 La Liga goal). Grzegorz Krychowiak: the highly touted midfielder who will be sought after by many of the top European teams. He is a technical number 6 who connects passes, calm in possession, and tracks back to make the play. The only concern that I have is his lateral quickness against savvy midfielders. The Polish international will foul if he gets beaten off the dribble. That is something to deal with when he faces the likes of a Eden Hazard or Kevin de Bruyne.